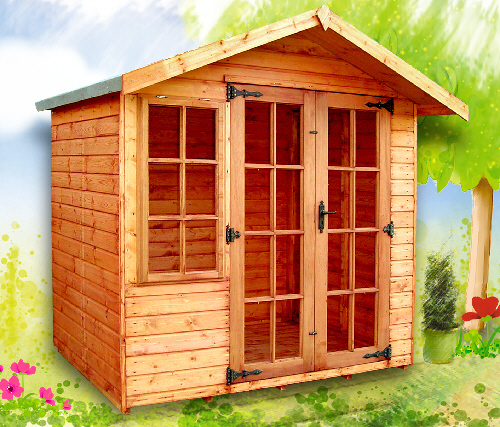 The Clipston - An Apex roof summerhouse featuring large pane doors and windows. The Clipston is supplied as standard with joinery made double doors with a fitted mortice lock, decorative hinges and handle, a 300mm roof canopy complete fascia boards. Manufactured from 15mm tongue and grooved shiplap on 45 x 34mm planed framework. Window size and quantity varies depending on the size of the building. A 600mm verandah and opening side window are available as an optional extra. Internal eaves height is 1.8m.